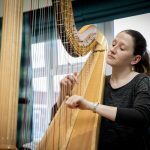 Top harpist swaps Albert Hall for Wrexham care home | News by Wales Express News, People Before Profit! One of the UK’s most talented young harpists treated care home residents to a virtuoso performance. Elfair Grug, 29, swapped the prestigious Albert Hall in London for Pendine Park’s Bryn Bella Care Home in Wrexham where she put on an hour-long concert. Her repertoire included classical music, some Irish, Scottish and Welsh folk tunes and some pop songs from the likes of Elton John and the Beatles as well as numbers from musicals such as the Sound of Music. The concert came about as the result of a partnership between the Pendine Arts and Community Trust and Arts and Business Cymru who provided additional funding via their Culture Step programme and the music teaching centre, Canolfan Gerdd William Mathias in Caernarfon. It was the first in a series of 15 concerts at Pendine Park’s care homes in Wrexham and Caernarfon and at other venues in the community. 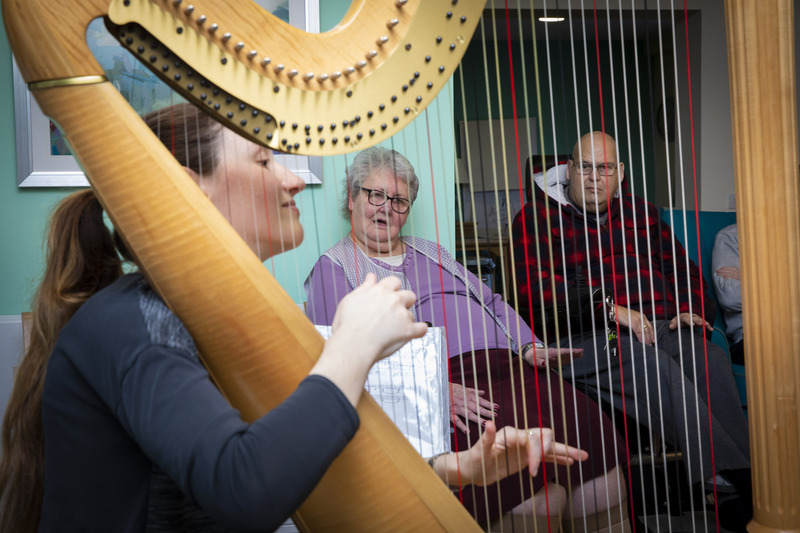 The project will culminate with a concert by former Royal Harpist Catrin Finch at Pendine’s Bryn Seiont Newydd centre of excellence for dementia care on April 18, ahead of her performance at the 2019 Wales Harp Festival concert at Galeri in Caernarfon. Elfair, who hails from Mynytho, in Gwynedd, is a former pupil of the renowned harpist, Elinor Bennett, at the William Mathias Music Centre at Galeri, Caernarfon, and went on to study at the Royal Northern College of Music in Manchester. She was a member of the National Youth Orchestra of Great Britain for a number of years playing in venues such as the Royal Albert Hall. And in 2008 she was one of 60 harpists who played at the Royal Opera House when Prince Charles celebrated his 60th birthday. 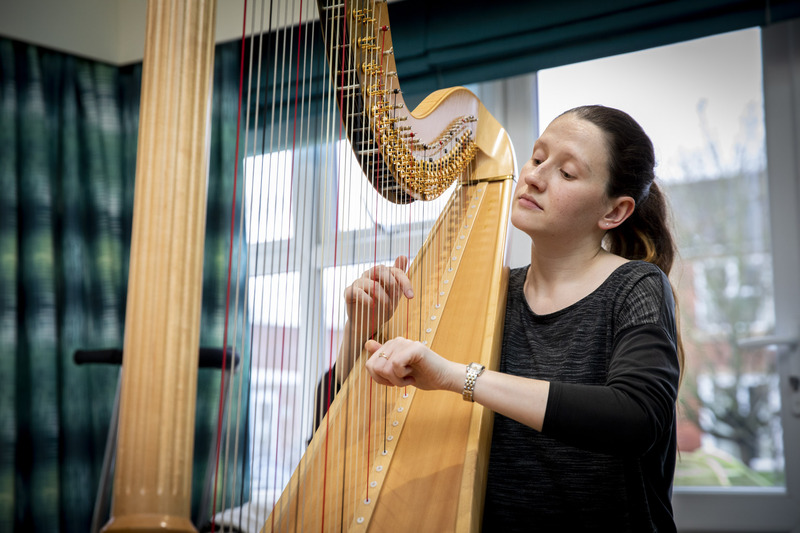 Elfair went on to spend two years living in Bangkok in Thailand where she worked as a harp teacher and harpist in residence at the Tamnak Prathom Harp Centre which is supported by the Thai Royal Family and is twinned with the William Mathias Music Centre in Caernarfon. She said: “I always enjoy performing in care homes – it’s intimate and so rewarding. I work freelance as a harpist and perform with full orchestra’s or chamber groups but the reaction you get as musician from many care home residents is amazing. Bryn Bella resident Tracey Wilde, 57, enjoyed the concert as she had herself trained to play the harp as a teenager. Tracey, who has had a stroke, said: “I really wanted to learn to play the harp as a teenager and had lessons. The concert also brought back fond memories for Mike Blakeley, 59, a resident at the Penybryn Care Home. He said: “I really enjoy harp music. I had a girlfriend when I was about 15 who played the harp really well and listening to the concert brought back some really good memories. Bryn Bella Care Home residents Julie Barnwell and Christine Jones both enjoyed the concert. Julie said: “I love it especially The Sound of Music, which was the best tune. Pendine Park’s musician-in-residence, Nia Davies Williams, said: “It’s an important part of the Pendine Park ethos that we use the arts to enrich the lives of people across the generations. Our enrichment programme involves art in all its forms including music, poetry, storytelling and painting. 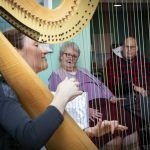 “The arts are embedded in all our staff training programmes to ensure that enrichment is a part of daily life for everybody here and this project will enable Canolfan Gerdd William Mathias and Pendine Park to build on their relationship following Pendine’s sponsorship of the 2018 Wales International Harp Festival. Culture- 1,2,3,4 Pendine Park Summerhill Wrexham; Culture step project with harpist Elfair Grug . Pictured is harpist Elfair Grug. Culture-5 Pictured are resident Tracey Wilde and harpist Elfair Grug. Culture-6 Pictured resident Julie Barnwell listens to her favourite song , your song by Elton John. Culture-7 and 8 Pictured residents Christine Jones and Steve Ferrier clap along to music played by harpist Elfair Grug. Culture-10 Pictured iis Chris Lewis with residents Mike Blakeley and Sara Berhe. Culture-17 Pictured Nicky Clarke with resident Rachel Clarke.